His passion for strengthening Puerto Rican education through volunteering comes from his own life experiences. Manolo acknowledges that he would not have accomplished as much as he has without the mentors that guided and mentored him throughout his career and life and that shared their enthusiasm for science with him. “I have always felt a passion for teaching going beyond just knowledge, so that the person, child or teacher feels excited by his classes or seminars”. For Manolo it is very important to transmit that energy: “Your passion for your career is contagious and if you share it, people understand you better and they also get to experience what it feels to do what you love. When you do something that you are passionate about, the way you talk about it is different; you talk about it with you brain and heart in it. When your heart is behind the things that you do, it is much more powerful and affects everyone equally: family, students, and the people around you. That is how you transform a country”. Manolo speaking Nemesio Canales II students about what scientists do. Photo provided by Dr. Díaz-Ríos. Manolo’s interest for science began at an early age when he visited his grandparent’s farm in Comerío. At the farm he discovered his wonder for nature and everything else around us. The support of his parents was pivotal for his participation in science fairs during high school. Once at the university, while pursuing a bachelor degree in Biology at the UPR Río Piedras, Manolo had his first field research experience at the El Verde experimental station in El Yunque, where worked closely with a graduate student. The goal of the research was to understand how different species of plants compete for nutrients under the forest’s canopy. The passion with which this graduate student explained every concept was what sparked in Manolo the interest to search other scientific disciplines to find his own niche in science. After finishing his bachelor’s, Manolo had the opportunity to go to Prague in the Czech Republic to do research. The then director of the Institute of Neurobiology, Dr. Richard Orkand, and his collaborator at the Institute of Experimental Medicine and Neuroscience at Charles University in Prague, Dr. Eva Syková, lead an exchange program. That summer in Prague- submerged in fascinating research and working side by side with people from diverse countries and cultures, but united in the search for knowledge- was for Manolo a critical experience that cemented his decision to continue graduate studies. Manolo during his research exchange trip to the city of Prague (Czech Republic, 1997) thanks to Dr. Richard Orkand, then director of the Institute of Neurobiology. Photo provided by Dr. Díaz-Ríos. Following this experience, Manolo began his doctorate at the Department of Anatomy and Neurobiology at the Medical Sciences Campus of the University of Puerto Rico. There he learned first hand the importance of perseverance and vocation in science. His desire was to record electrical activity in cells using neurophysiology, and it was for that reason that he joined Dr. Mark Miller’s laboratory at the Institute of Neurobiology where he used the mollusk Aplysia californica (sea hares) to study how neurons controlled feeding in this invertebrate animal. One day, just before hurricane Georges went through San Juan, the lab had just received a costly shipment of these mollusks from California. The passing of hurricane Georges signified the loss of electricity and consequently the death of these animals. To avoid such a loss, Manolo stayed in the laboratory the entire weekend so that he could use the animals. His dedication and perseverance, and 30 hours of work, helped him to publish his second scientific publication as a graduate student. He tells us: “The knowledge I acquired and the 7 publications that I had the privilege to author as a graduate student helped to grow greatly in my career. The scientific environment at the Institute of Neurobiology, which provides the perfect platform to promote imagination and collaborative projects, made a great difference in my career”. Manolo’s beginnings using invertebrate animal models took him to continue his studies in more complex systems like mice. Another mentor in his career was Dr. Ronald Harris-Warrick with whom he pursued postdoctoral studies at Cornell University in New York. These research experiences not only allowed Manolo to explore fundamental concepts about communication between neurons, acquire a new technical repertoire, and to experience new work environments, but they also allowed him to find his scientific niche- the motor nervous sytem- and his philosophy as a laboratory director: to reach the most number of minds possible through mentoring and education. Manolo participating at a science expo at Colegio Marista. Photo courtesy of Dr. Díaz-Ríos. Manolo is very aware that there is a lot of undiscovered talent in Puerto Rico and less developed countries, and that there is a need for more leadership positions for women in science. For this reason, it fills him with pride and emotion to serve as a mentor for young women scientists. “We have to use our position as mentors to help increase the number of women in science, which is important both in the scientific and social aspect. Men cannot be the only ones making decisions in companies or in academia. We need diversity of thought to reach better decisions as scientists”. As part of his contribution to support women in science, Manolo participates in the program Celebrating Women in Neuroscience (C-WIN) from the Society for Neuroscience, where he is a mentor to women graduate students and postdocs from South America and Africa (among other countries), and helps them to establish collaborations, scientific equipment and materials. Manolo’s mentoring experience already surpasses more than a decade of service. During this time he has actively worked to train and educate teachers, students, and the general community in science, and sharing his experience of doing a job by vocation. Currently, Manolo is funded by the Grass Foundation to carry out an educational reform project that consists in providing neuroscience laboratories to public schools in Puerto Rico. 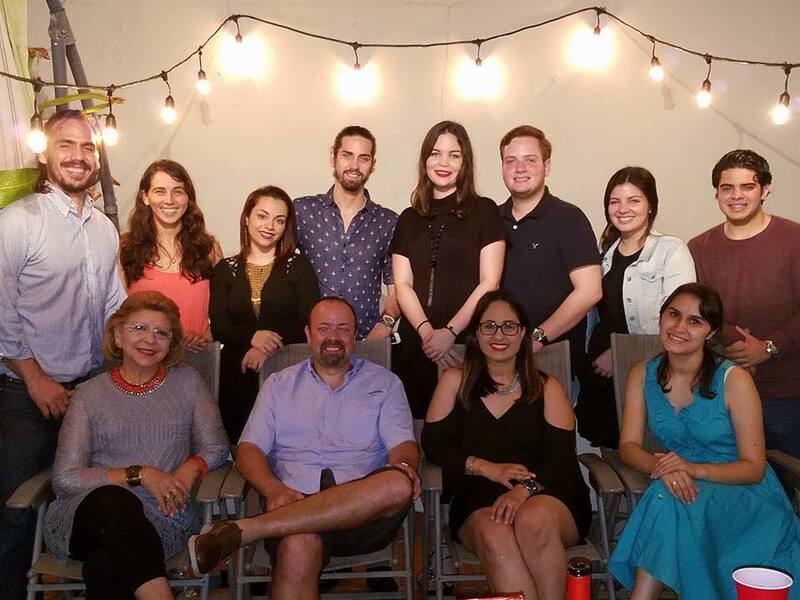 This effort has now exponentially grown after he joined the Neuroboricuas team, a group of students, scientists, and community members invested with Puerto Rican education and have the goal and vision of reforming education in our country. Manolo and the NeuroBoricuas team and other volunteers that participated in the event "Explore your brain at the SanSe" 2017. Photo provided by Dr. Díaz-Ríos. Manolo has also worked for more than 5 years supporting public school students and teachers in the development of science fair projects, particularly in schools with little access or exposure to research opportunities. In this role, he trains teachers and provides them the necessary tools so that they may develop sustainable long-term projects. Manolo is also known for coordinating field trips for high school students to the Institute of Neurobiology so that, from its magnificent setting at Old San Juan, they can appreciate science from another perspective and this motivates them to continue careers in science. Furthermore, Manolo is currently collaborating with Proyecto Caras to help reform the Juana Matos community in Cataño through education. More recently, he also joined the board of directors of Iniciativa Comunitaria to strengthen the education component in the community. Students from the Juana Matos community in Cataño interested in science visiting the Institute of Neurobiology. Photo courtesy of Dr. Díaz-Ríos. Manolo is very proud of the dedication and effort put by students and laboratory personnel, as well as of the impact his group has had in the scientific community through the years. He is also very pleased that his students leave the lab with a humanistic perspective that emphasizes that scientists should and could be change agents in our communities with just sharing our enthusiasm for science. “We are going through a very hard time for our Island and it is important that scientists have a voice and become agents of change”. To know learn more about Manolo visit his profile. Manolo with the science club from Colegio Rosabell during their visit to the Institute of Neurobiology. Photo provided by Dr. Díaz-Ríos.